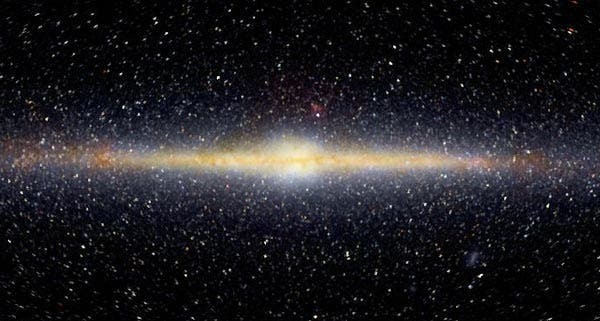 The research, funded in part by the National Science Foundation and titled “Rings and Radial Waves in the Disk of the Milky Way,” was published today in the Astrophysical Journal. Newberg, Xu, and their collaborators used data from the Sloan Digital Sky Survey (SDSS) to show an oscillating asymmetry in the main sequence star counts on either side of the galactic plane, starting from the sun and looking outward from the galactic center. In other words, when we look outward from the sun, the mid-plane of the disk is perturbed up, then down, then up, and then down again. The new research builds upon a 2002 finding in which Newberg established the existence of the “Monoceros Ring,” an “over-density” of stars at the outer edges of the galaxy that bulges above the galactic plane. At the time, Newberg noticed evidence of another over-density of stars, between the Monoceros Ring and the sun, but was unable to investigate further. With more data available from the SDSS, researchers recently returned to the mystery. When they revisited the data, they found four anomalies: one north of the galactic plane at 2 kilo-parsecs (kpc) from the sun, one south of the plane at 4-6 kpc, a third to the north at 8-10 kpc, and evidence of a fourth to the south 12-16 kpc from the sun. The Monoceros Ring is associated with the third ripple. 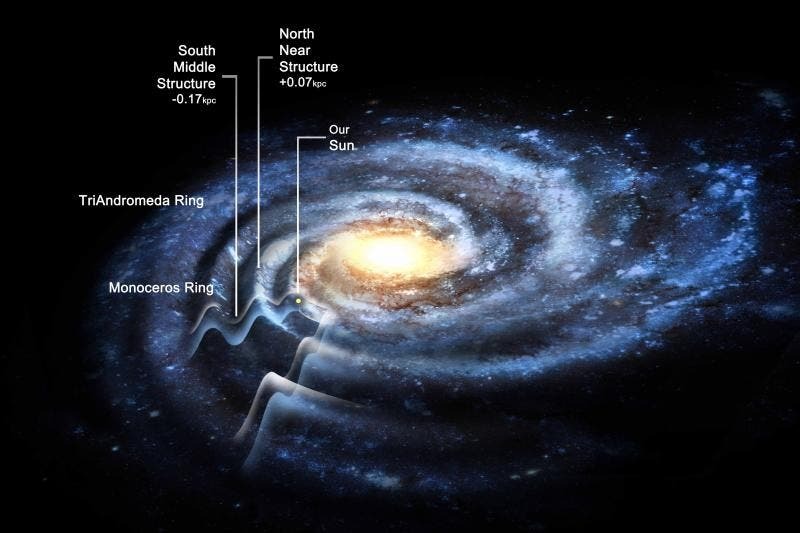 The researchers further found that the oscillations appear to line up with the locations of the galaxy’s spiral arms. Newberg said the findings support other recent research, including a theoretical finding that a dwarf galaxy or dark matter lump passing through the Milky Way would produce a similar rippling effect. In fact, the ripples might ultimately be used to measure the lumpiness of dark matter in our galaxy. The research was funded by the NSF, as well as the Chinese National Science Foundation and the National Basic Research Program of China. Newberg currently researches the structure and evolution of our own galaxy, using stars as tracers of the galactic halo and disks. These stars in turn are used to trace the density distribution of dark matter in the Milky Way. She has been a participant of the Sloan Digital Sky Survey and is currently head of participants in LAMOST U.S., a partnership allowing U.S. astronomers to take part in a survey of more than 7 million stars by the Large Sky Area Multi-Object Fiber Spectroscopic Telescope in China (LAMOST).